Located in Toronto, Ontario, Steve is an accomplished guitarist and a fun, energetic teacher he is skilled in many genres and performs and records in a variety of musical styles with several different local and international projects. 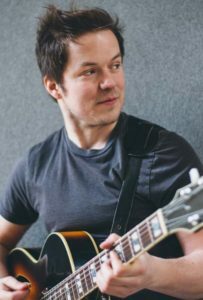 A graduate of the renowned Grant MacEwan University guitar program in Edmonton, Alberta, Steve has been playing the guitar professionally for over ten years. In that time he has toured, recorded and released several albums with a variety of different musical projects in almost every musical genre. A rock and roller at heart he is also a skilled jazz musician and has a great understanding and appreciation for everything from classical to modern pop music and electronica. Along with his experience in the industry, Steve is also an accomplished guitar, banjo and theory instructor and clinician. Before moving to Toronto, he held the senior guitar instructor position at the Yamaha music school in Edmonton and was a frequent host of dozens of guitar and composition clinics throughout the province. As a teacher, he is patient, friendly and energetic about the joys of learning music and is experienced with students of all age groups and abilities. He emphasises developing a great enjoyment of music along with learning all the necessary technical aspects of playing an instrument. Currently, Steve resides in Toronto and is an in-demand session guitarist/banjo player; he leads several of his own projects including Toronto-based gypsy-jazz band iSpy, progressive hard rock band Atlas Shrug, modern folk-rock/electro band Benhur and his own jazz project the Steve Frise Trio. As a sideman he has played with countless Canadian artists including Colleen Brown, Noel Johnson, Joy Philips, Portal, Derek Christie and Dani Jean and has shared the stage with P.J. Perry, Johnny Reid, George Canyon, Paul Rodgers, Smashmouth, Prism, Streetheart and many others.